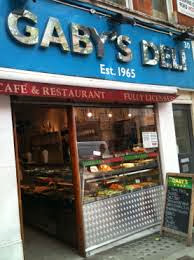 As a Londoner born and raised with family in the theatre business, I have long been familiar with Gaby’s Deli in the West End. Gaby’s is the place to go to for when I catch up with a friend over lunch (with inevitable copious amounts of house red) or for grabbing some dinner before heading off to see a film across the road. For animated social occasions or times alone with just a book for company, the atmosphere at Gaby’s always suits. Less than a minute’s walk from Leicester Square tube station and close to a number of theatres and other attractions, Gaby’s is popular amongst an eclectic array of customers including actors, local office workers, media types and tourists.